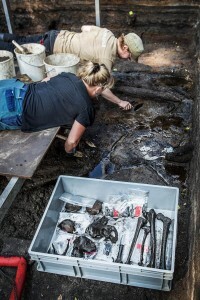 When last we dropped in on the excavation at the Alken Enge bog in East Jutland, Denmark, archaeologists had found the remains of an estimated 200 men killed around 1 A.D. and thrown into a part of Lake Mosso which has now receded leaving the peat bog. The discovery of arranged bones, notably four pelvises on a stick, was evidence that the remains were deliberate sacrifices, not discards after battlefield cleanup. A newly published report in the Proceedings of the National Academy of Sciences updates and expands on the discoveries and their larger significance. All together, 2,095 bones and bone fragments from 82 people were unearthed. Extrapolating from that figure based on the distribution of the remains increases the earlier estimate of people buried in the bog to 380, almost all adult men. The preponderance of unhealed sharp-force trauma indicates they died in battle, and the lack of previously healed wounds of this type means they were not seasoned fighters. Weapons found in the excavation — spearheads, an axe, fragments of swords, shields, iron knives — confirm the military nature of the clash. Metallurgic analysis found that the weapons were manufactured from local Jutish raw materials. Gnaw marks on the bones indicate the bodies were exposed for six months to a year after death before the skeletal remains were deposited in the lake. There were also cut and scrape marks on the bones, evidence that the remains were treated before they were carefully arranged and deposited. This systematic and stylized approach to a clearing of the battlefield likely had a ritual purpose. There are only a handful of other battlefields from the the turn of the millennium known, all in Germany and none of them with significant human remains. They are also thought to be the result of clashes between Germanic tribes and Roman forces pressing northwards. 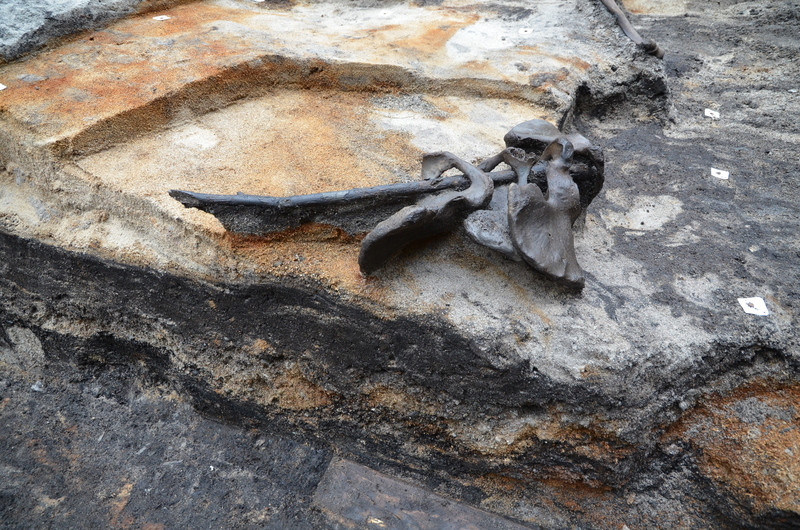 The Alken Enge excavation is the sole known example we have of large-scale human remains and from an intra-German battle. Alken Enge provides unequivocal evidence that the people in Northern Germania had systematic and deliberate ways of clearing battlefields. Practices of corporeal dismemberment, modification, and bone assemblage composition suggest a ritual dimension in the treatment of the human corporeal remains. Taphonomic studies indicate a postmortem exposure interval before a deposition in the lake of 0.5–1 y, which is unprecedented in relation to the known burials and bog bodies. The estimated MNI in Alken Enge significantly exceeds the scale of any known Iron Age village community and presupposes that the fighting groups of men were recruited from a large area beyond its immediate hinterland. The preponderance of young adult males suggests that a selected group ended up in the wetland area. High incidences of perimortem trauma show that the conflicts were extremely destructive in character, with consequently comprehensive slaughter. Overall, the Alken Enge find is exceptional of the period, but it anticipates the comprehensive postbattle weapon depositions from the second to fifth centuries AD in Northern Germania. In this way, Alken Enge provides a new, yet older, testament to the history of the militarization of the Northern Germanic societies and stresses the formative significance of the expansion phase of the Roman Empire at the turn of the era.